Whether worn while diving the oceans of the world or ashore, the Diver Collection continues to raise the bar for the marine timepieces. Ulysse Nardin reveals its latest model fit with a new dial design and a bracelet matching to the colors of the case. 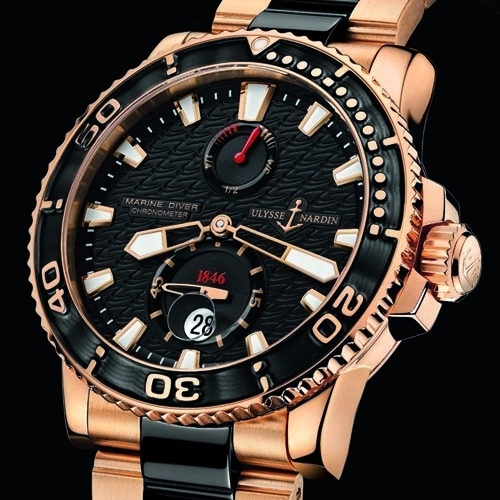 Carrying on the characteristics of the family with its large diving scale figures in gold on the dark rotating bezel, the newest Maxi Marine Diver features a wave-patterned black dial which supports applied luminous indexes in a striking contrast. The power reserve is indicated at 12 o'clock while the date and an oversized small second are displayed on sub-dials at 6 o'clock. Additionally, 1846 date is imprinted in red on the dial and pays homage to the year brand was founded. Its 42.7 mm case in 18 ct rose gold is individually engraved on a side plate in gold and houses an automatic movement with a power reserve of 42 hours. The exhibition case back offers an excellent view of this spectacular movement, whose rotor is produced in 22 ct rose gold. Provided with a screwed crown, the model is water resistant to 200 meters. The 18 ct rose gold bracelet incorporates black ceramic elements and matches perfectly to the dial and the case. While giving the watch a clean finish design, it strongly emphasizes this beautiful alliance.